The best part of finishing a project is the guilt free beginning of something new. This one isn't entirely new. 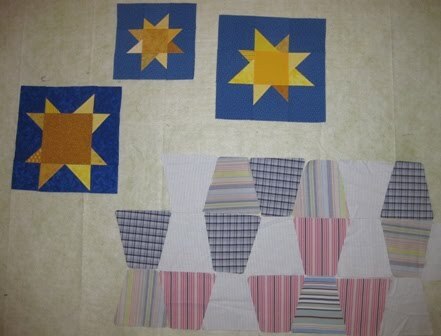 I've had the fabric collected together for a while now, and I started with a couple of star blocks last week. Today I started on the letters though and they are all done, but not put together yet. This quilt is one that Anna requested. 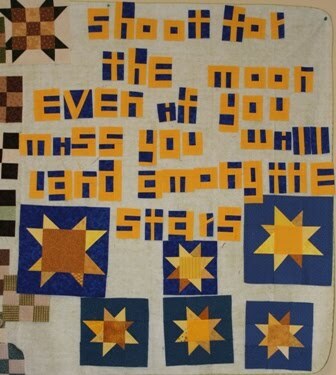 Her room is moons and stars and she chose the saying and requested wonky stars like the ones in this quilt. The design is still under construction, but I'm thinking that "shoot for the moon" will go in the upper left corner, maybe followed by a dot dot dot. Then the lower right corner will have "even if you miss, you will land among the stars. Then at the top I'm thinking of making a big moon out of yellow and orange crumbs. 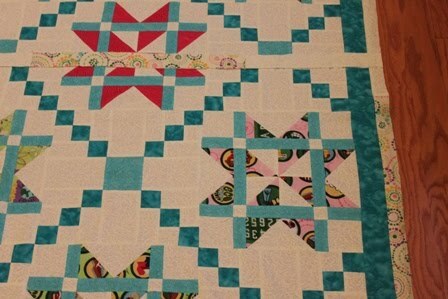 then the bottom half will have the star blocks randomly sprinkled around among a varied blue background. I'd like all of that to fit on the top of the bed, so I might do a border of yellow stars for the overhang part of the bed. Kurt was off today, giving me time to work though it was still sprinkled in with looking after the kids. We had lots of friends over and it was quite loud all day. He was nice enough to take them all to Hobby Lobby tonight and all is calm and quiet at the moment. I think I'll settle down with the remote control and hand sew some binding. Maybe I'll tidy a bit first. Wonky letters are lots of fun, but they sure do make a mess. Girl Scout Cookies is done except for the binding which is already cut. Getting it sewn on today should not be much of a problem. Kurt has taken Anna and Ryan off to camp and beach volleyball leaving Sydney and I to putter around the house at our leisure. This is a little longer than the charity quilts I've been making lately. 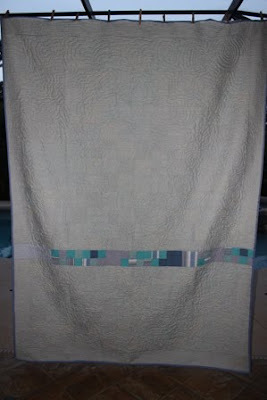 I ran out of batting with just one more row of quilting to do and had to hand sew a strip onto the end. You can see that it hangs down onto the pool deck even though I moved the clothesline up as much as possible. I pieced the back, but with it hanging up and the sun shining through you can see the front at the same time. I just love that stained glass look. 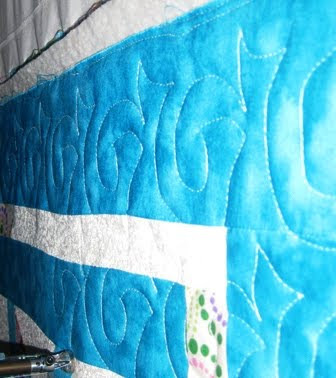 The quilting pattern is a pantograph from Golden Threads called Saxon. It is just a simple swirl really, but pointy. I think it adds a nice texture without being overwhelming. Sydney has called dibs on this quilt. We are getting ready to redo her room (again!) and she is thinking of a teal blue with either butterflies or fish. She's seven, so that could change several more times before she settles on something. I just pulled Judy's June Mystery off of the frame. I'm going to call it Girl Scout Cookies. Even though it isn't readily apparent, all the colored fabrics are Girl Scout themed. 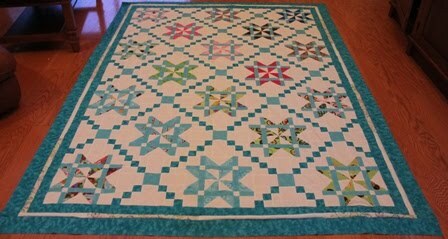 It's been sitting on the frame for days now, and I've been doing drive by quilting. Wake up, quilt a row, drive somebody somewhere, come back and quilt another row. Watch the kids swim, quilt three rows before lunch. And so it goes. It is of course, dark by now, so I'll have to get a proper picture in the morning. Maybe by then I'll have it trimmed and the binding ready to sew on. DH is off tomorrow, so this is our Friday night. Not exactly date night around here, but I guess I should go and be social for a while anyway. I'm hoping he'll get up early to do the morning driving and leave me to sleep in. I'm running out of days to sleep late, just 4 more days until teachers are back at school. Thanks to Amy for today's Thrifty Thursday suggestion. When traveling to the farm on weekends she carries safety pins in an empty Crystal Light container. It is a convenient size with a diameter of 2.5 inches and height of 6 inches, and has a snap tight lid. I bought several yo you makers ages ago, thinking that yo-yos would be nice carry around hand work, but I just don't ever seem to get to it. 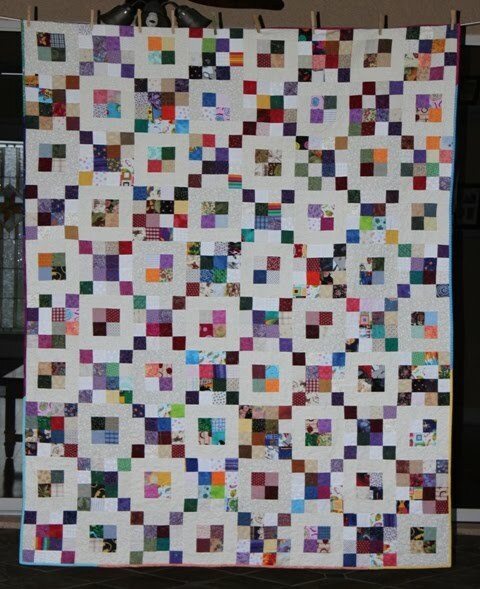 It bugs me that when sewn together, they make a quilt with open spaces, more like an afghan than a quilt really. I used to try cuddling up under afghan and get frustrated when my toes would get stuck in all the holes. 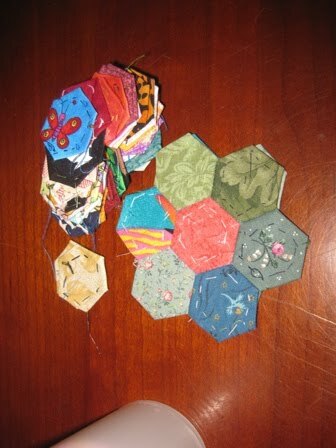 Now, hexies on the other hand, are all the rage right now. I can see why, these shapes actually fit together in lots of interesting ways to make fun patterns. 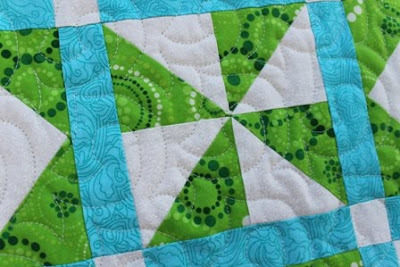 When sewn together, they make a quilt top that isn't full of wholes. So, for those working on hexies, a Crystal Light container is just the right size to hold your work in progress along with papers, fabric, scissors, needle and thread. The lid snaps on to keep it all safe and organized, and it is just the right size to fit into the cup holder of your car or the bottom of your purse. 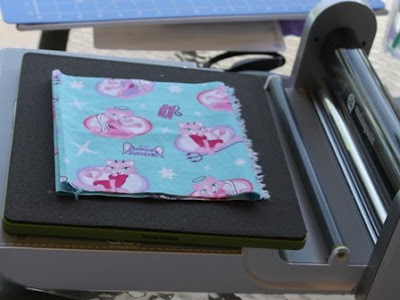 The key to getting work done is having something ready to go when you are dashing out the door, so how about putting together a little sew on the go kit of your own? 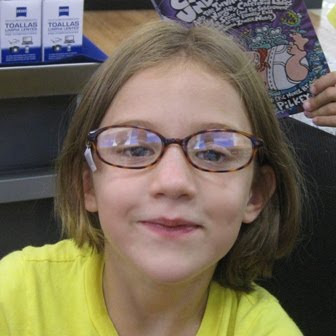 Sydney had an eye appointment today and picked out these glasses. She's never worn glasses before and is SO excited about it. I'm sure that will wear off soon enough. I was pretty shocked that she didn't end up with something pink or purple. She doesn't really NEED them to see, but they are supposed to make it easier for her to focus on the letters when she is reading. Anna has a Mr. Science camp this week that goes all the way to 5 in the evening. That left us plenty of time to make a trip to our BRAND NEW Hobby Lobby. Today was their grand opening though I have heard through the grapevine about people who went last week. I used my 40% off coupon to get a little purple graduated fat quarter bundle and got a little bit more fabric for the Christmas BOM at 30% off. Ryan was suitably impressed with the Lego selection and Sydney fell in love with the build your own dollhouse kits. 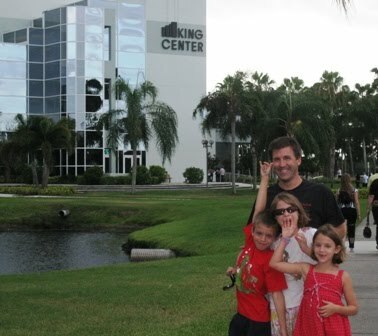 I'm sure we'll be making a lot of trips here in the future. We cooked out on the new grill for dinner and were just sitting down to eat when we saw a strange man on the roof next door. Yes, the houses here are close enough to each other that I could take this photo from my kitchen table. We were puzzled at first, but soon figured out that he was there to take care of a bee hive that had taken up residence in the eves. We had a swarm land on our house a couple of years ago, but I guess they didn't like our roof and moved to the one next door instead. 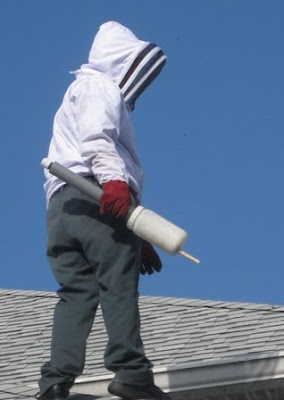 It was pretty interesting to watch him climbing around on the roof squirting smoke and dodging bees. I'm not sure if it worked, eventually we all went back to eating before our food got cold. After sending the kids off to bed I put together three more block of the month blocks. I am almost caught up again!!! 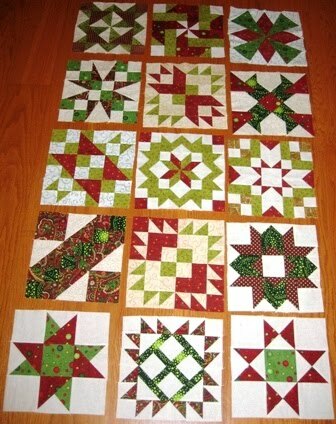 I think these are the June Blocks: Cobwebs, Constellation and County Fair. Now, on to July -- I'd better do it quick before the August blocks come out. I took some time this weekend to catch up on the block of the month that Amy is hosting. 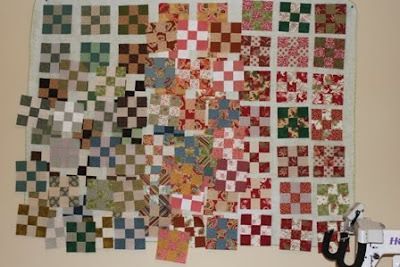 That makes 12 now, though Kurt swears that there is no way they should all go into the same quilt. He says that in one sentence while telling me in the next that we don't need 2 Christmas quilts. Sigh, I guess I shouldn't ask his opinion if I don't want it. Go over to Judy's blog to see what everyone else is up to for Design Wall Monday. We have one last summer camp this week along with an eye doctor appointment. It was one of those weekends where we chose not to do several things because the days just seemed too full. With just two weeks until school starts, the days are getting more precious. Anna had a Girl Scout swim party this afternoon with her new troop of which I am not the leader (!). It is giving her a chance to meet some of the people from her new school. I hope that it will help ease her transition. Ryan had a chess tournament and lost all his games but took it very well. I guess only very good players come to summer tournaments. I spent some time in between loads of laundry and dishes today sewing together some of the blocks of the month that I cut out yesterday at ice skating. I was going to piece them in order, but Road to the White house was for from May and somehow got ahead of Pennsylvania Parade from April. I'll make sure to do that one next so I don't get myself confused about what I've done. Maybe if things are calm after pizza tonight I can get some more done. Sunday is always our pizza night because we are all too tired to cook after the weekend festivities. 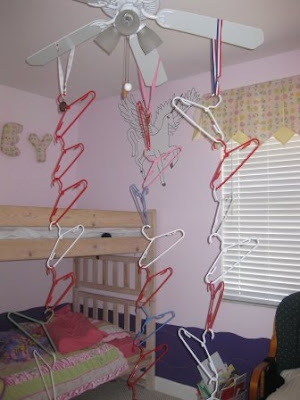 Sydney had a friend over to play and they made hanger art out of the ceiling fan. I should have suspected that they were a little too quiet up there. I made a rule that all the doors have to stay open, but they manage to find trouble anyway. 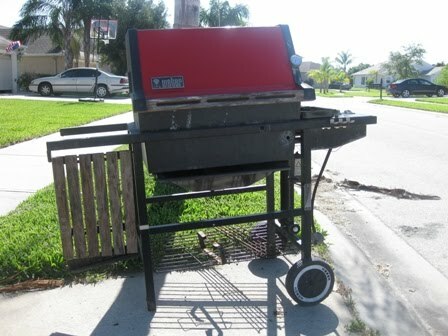 I managed to knock the last front wheel off of the grill while pressure washing Friday. That meant that Kurt had to go out today and get a new one. End of summer is a good time to buy outside things. Isn't it shiny and new? 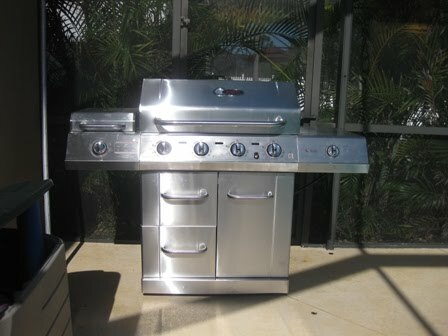 I can't believe nobody wanted to cook something on it yet, but it will stay shiny for at least another day. Next week is a maze of last minute appointments, orthodontists and ophthalmologists, I think there is still one more summer camp to go as well. It is good to take care of as much as possible during the summer, but part of me wants to enjoy just a few more days of relaxation. Now that I think about it, there haven't exactly been a lot of those lately. Maybe going back to school is a good thing. 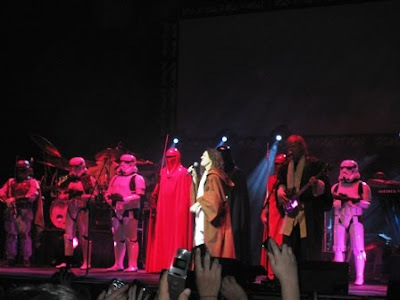 Last night we took the kids to a Weird Al Yankovich show. 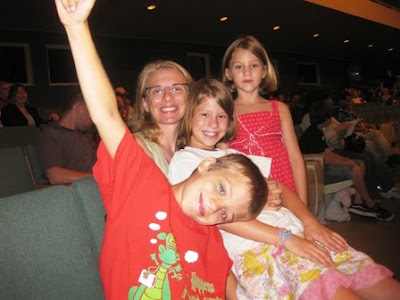 It was their first concert ever. They are big fans and know a lot of the songs by heart. Does that say something about the intelligence level of the lyrics? It didn't start until 8, which is bedtime in our house, so we were a bit worried that they would be fast asleep before the concert was done. Sydney is the only one who fell asleep for any extended period of time, she snuggled up on my lap and snoozed through all the noise starting right in the middle of Eat It, one of her favorite songs. She perked up again for the encore though, and didn't seem upset about missing part of the concert. This was Ryan's favorite song and he was singing along with all his might and bopping up and down in his seat. We're big fans of all things Star Wars around here. I took Amy's BOM to ice skating this morning to get caught up a bit. I didn't realize how far behind I had gotten! They are all cut out now though, and I should be able to do the sewing portion some time tomorrow. 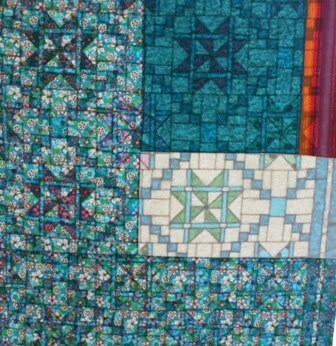 I took time this afternoon to load the June Mystery Quilt onto the frame. I chose a pantograph called Saxon and got the first row sewn before it was time to think about dinner. I'm taking care of a neighbors two dogs while they are away for a couple of days. I went down earlier to feed them their dinner. The doberman discovered a bird that had gotten trapped in the pool screen and was frantically chasing it around and around. She wasn't very smart about it though, and was outside trying to catch the poor bird who was inside and couldn't figure out what to do. I chased them both around in circles for what seemed like hours before finally catching the poor bird in a towel and pitching it over the fence. While all of this was going on, the other dog, a golden retriever, decided to take a swim in the pool. 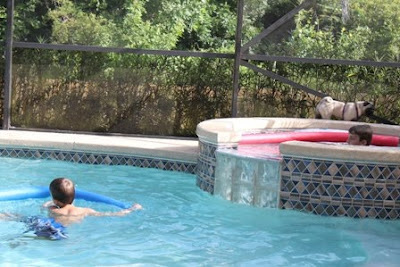 It was quite a sight I'm sure, me running after a bird, yelling at the dog to leave it alone while dragging the other one out of the pool, dripping wet and pitiful. It made me so glad that we have just one small dog. 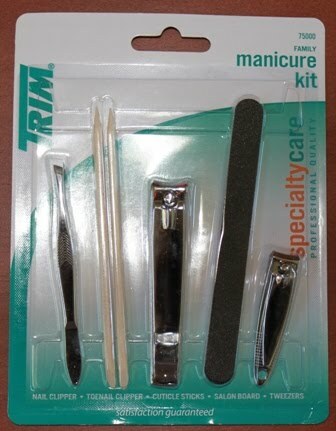 I saw this little manicure set at the checkout stand while buying groceries. It was $1.97 and had all sorts of tools that would be handy for quilting. The tweezers are handy for pulling stray thread, the rosewood stick make nice stilettos for guiding fabric under the presser foot or poking out corners. The fingernail clippers are good for clipping threads, especially in places that don't allow scissors. The quilt shop sells official quilt police approved versions of lots of tools like these, but how much nicer is it to find them reasonably priced? Next time you are wandering the aisle at a grocery, discount or drug store, think about creative uses for the things you might already have around. Have a thrifty Thursday. Even after all those nine patches, my 2.5 inch strip bin won't even think about closing. I guess I'll make a few more. Today is the great cousin swap in reverse. I have missed my girls and can't wait to see them again. They have been having fun though, and a little separation can be a good thing. Schedules are out for the new school year along with supply lists and meeting dates. I guess it is time to start shifting gears out of summer mode. I've had my new Go Cutter for about a week now, and I've been playing with it here and there. I started with my scrap basket and worked my way through the little bits and pieces. With no particular goal in mind, I just started matching up scraps to shapes and filing them away. The most frustrating thing I found at the beginning was not having the dies for the shapes that I usually cut. I have a routine worked out for cutting scraps into frequently used sizes bases on Bonny Hunters Scrap User's system. 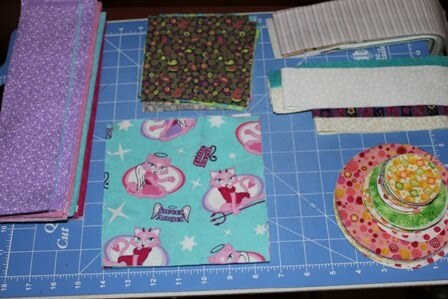 I use 5 inch squares for the Girl Scout quilts, so I focus on those first, especially with novelty fabrics. After that I cut strips, usually 2.5 inches, but sometimes 3.5. When the fabric gets too small for that I switch to 2 inch strips and then 1.5 inches. So after I started getting the hang of the whole GO cutter thing, I began to work out a system. By looking at the dies I had, I estimated the width of fabric that would fit nicely in each die. 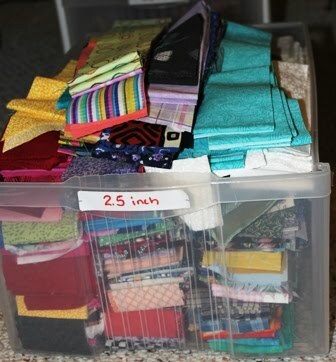 Then while going through my scrap basket, I looked for fabric that would work with those dies. I went ahead and rotary cut the shapes that I didn't have dies for. For the rest, I just loosely cut fabric into pieces that were a little bigger than the shape I had in mind and stacked them on top of the die that I wanted to use. I carried out this whole experiment in fabric while sitting next to the pool making sure nobody was going to drown. Once I got a system going, cutting the fabric went really quickly. By the time the kids were ready to be done swimming, I had a nice little collection of squares and strips and circles. 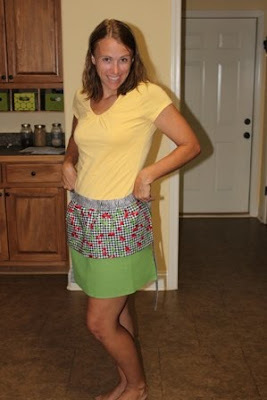 There wasn't much more waste than their would have been if I were cutting everything traditionally and it does go much faster, especially if working with yardage rather than scraps. 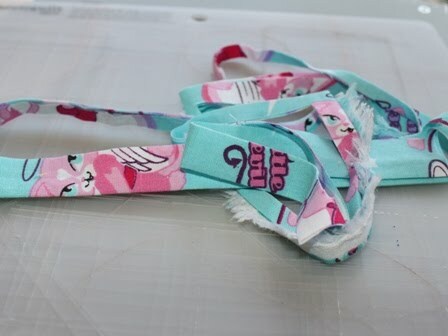 So, if you are thinking about getting a Go Cutter, think about how you cut fabric. Do you use specific shapes again and again? Would you make a quilt because it uses the shapes you have the die for? 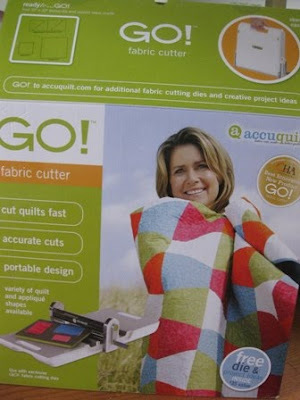 Are you willing to invest in the dies you need to make the quilts you want? I like gadgets, so the idea of using a cool new tool makes me happy. I can see myself having fun and making quilts to get the most out of my new cutter. I took the boys to the beach this morning. I was sitting in my chair, peacefully watching them bobbing in the water when a mom and her son came by looking at the sand. I didn't think anything of it, guessing that they were collecting shells. As they passed by though, they asked if we had seen the turtles. 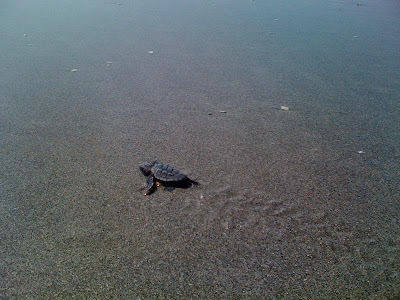 Turtles, I had missed them completely! It was almost 10 by then, the baking heat of the day was coming on full force, and any turtle in its right mind should have found the sea long ago. 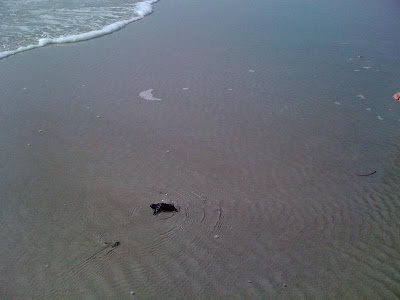 So we went to explore, and sure enough, there was a tiny parade of little baby loggerhead hatchlings valiantly making their way to the ocean. I'm sure most of the nest emerged under the safety of moonlight last night, but there were still four tiny turtles slowly finding their way. 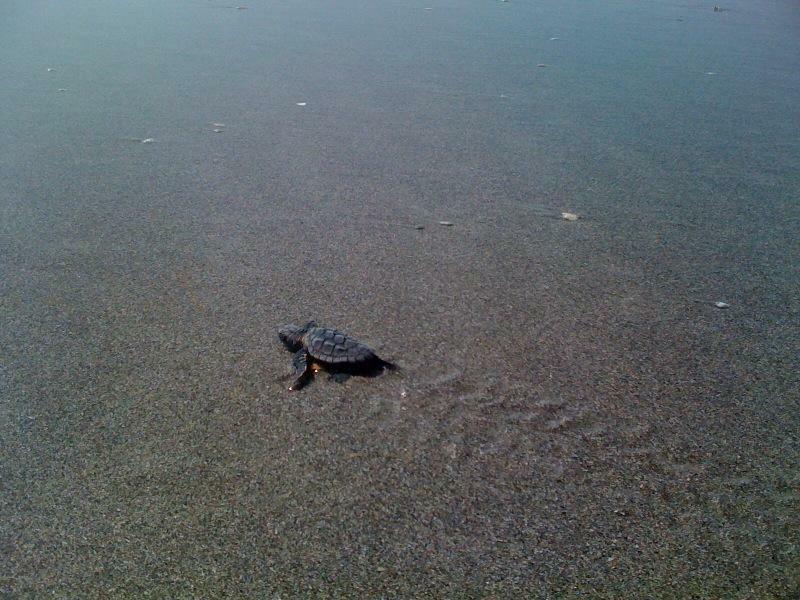 Over the next hour, we watched the first three find the incoming surf and swim away. The fourth though wasn't looking too healthy and we wondered if he would make it. He was starting to dry out and had gotten turned around backwards, struggling to survive. He managed eventually to get himself turned around and find his way. How difficult it was to wait with hands folded behind our backs while watching him flounder. Sea turtles are endangered though, and to touch them is strictly prohibited. 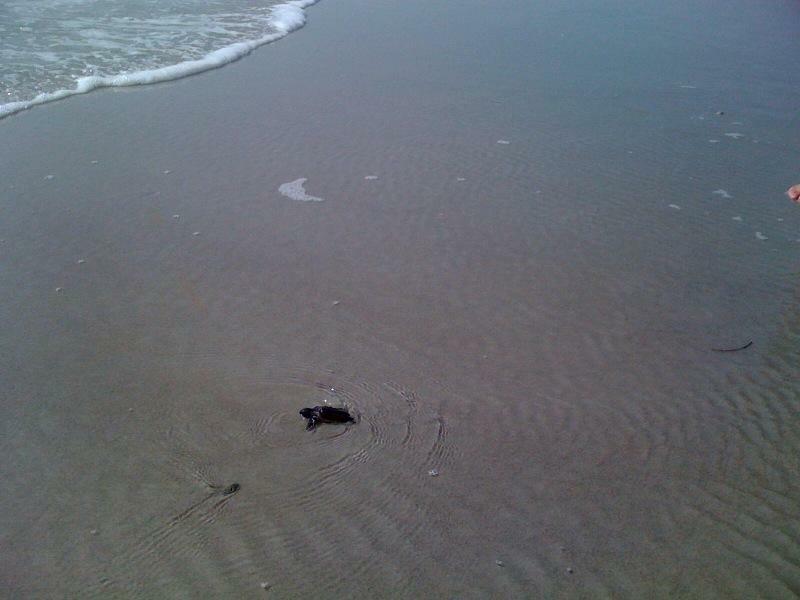 We all cheered for him as the final wave washed him out and away. After our morning adventure, the boys have been happy to play inside this afternoon, leaving me time to get some sewing done. I've polished off a huge stack of nine patches. I'm off now to do some ironing and throw them up on the design wall so they can tell me what they'd like to be when they grow up. I took three quilts along on our car trip this weekend that needed to have the binding hand sewn. I'm giving each of them their own posts so that I can link them to my finished quilt list in the margin. The finished quilt list in the margin is one of the things about my blog that makes me happy. Concrete proof that I have accomplished something tangible. Square Root was made out of shirt purchased from the Goodwill clearance center. 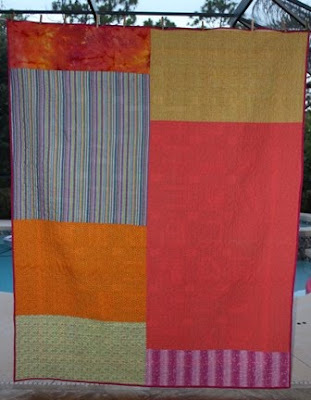 The total cost of the fabric going into this quilt was $5.73. 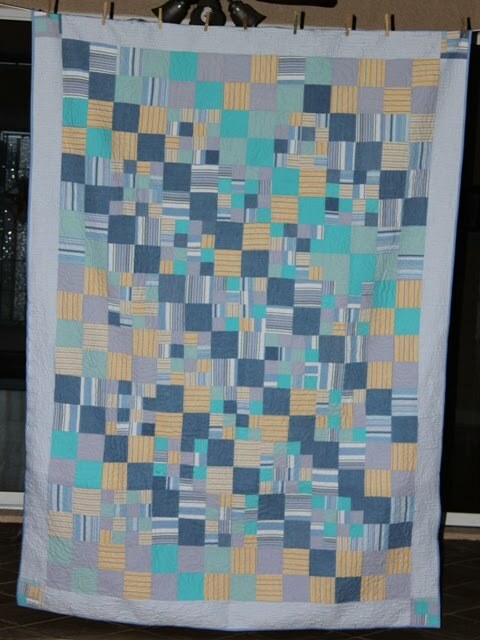 It also makes me feel happy that I could still make quilts even if I couldn't afford to go out and get new fabric. It uses a combination of 4 and 16 patches along with the fabric of 9 shirts, which explains the name. The back was a nice stripe from the donation pile, stretched out with the extra squares from the front. I quilted it with a freehand topographic spiral pattern and pink thread. So, 16 hours, 1 round trip and a big celebratory WOOOHOOO! I love crossing things off the list. Now I get to go and find new things to put back onto the list to take their place. Quilt number two on the binding list was Crumb Cake. 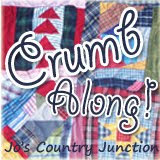 As the name implies, it is made of crumb squares; 7.5 inches of random scraps sewn together with no particular pattern in mind. 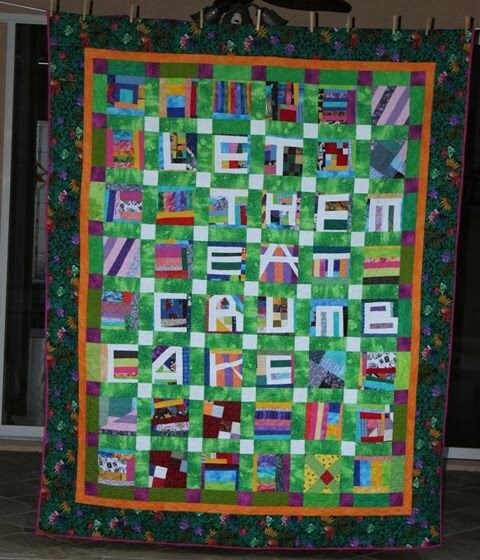 I had fun with the development of the idea for this quilt using free pieced letters. I'm not extremely happy with the choice I made for sashes and cornerstones though. It doesn't exactly highlight the blocks. I had enough of the same parrot fabric left for the border though. It is quilted with fleur-de-lis and finished with a hot pink binding. The back is just as random as the front. It used up several non quilt pieces of fabric that were in the donation box. The salmon color is linen and the stripe is that crinkly cotton, I think it's called seersucker. So, even though I'm not thrilled with the final product, I loved making this quilt, so I guess that is worth something in the end. The advantage of 16 hours in the car over a weekend is that it leaves lots of time for sewing down binding. Four Square was the first to be officially crossed off the list. It was a leaders and enders project using 2.5 inch squares sewn together randomly. 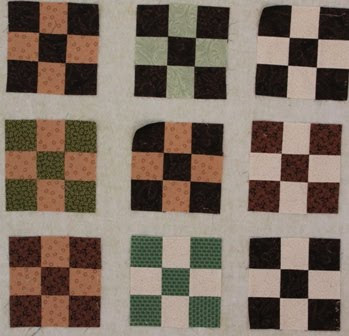 Four of them were alternated with single squares sashed with white. The four patches had been sitting in a box for a while and were mostly sewn together with dark and lights paired. I think it muddled the effect of the pattern, so the next time I make this quilt I'll use all dark or medium squares. 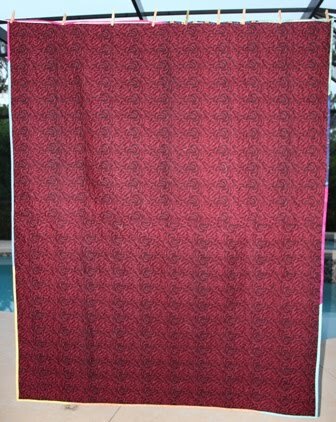 Since it is a donation quilt, I pulled this hot pink and black fabric from the donation stash. I almost never have enough of a single fabric for an entire back, but this time I did. The binding is random leftovers. We drove to Georgia this weekend to visit family and to trade out kids for the great cousin swap of 2010. Sydney is visiting her cousin Paige, Anna is staying with Noanie (Grandma), and we brought Austin back to stay with Ryan for the week. Make perfect sense, right? While we were there, my sister had a craft project lined up. 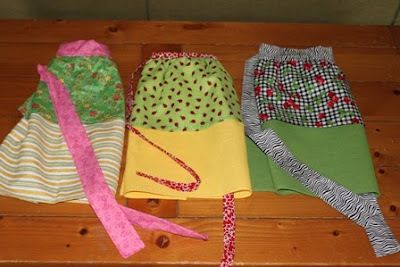 She saw some adorable aprons in a magazine made from tea towels. So we drove to Macon where they have a brand new Joann's and she picked out some coordinating fabrics. Seriously, how cute is that? She is a goddess of domesticity and often wears aprons while doing the Martha Stewart thing around the kitchen. 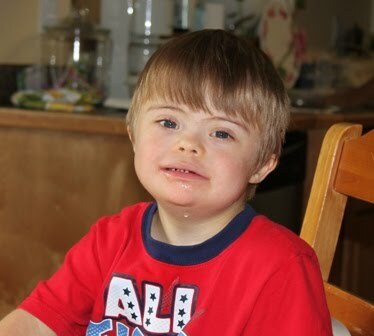 I didn't get many photo's of the kids, but here is Zach. He is three now and doing just great at the moment. We are glad to be home again safe and sound. We do the 8 hour drive often enough now that it doesn't seem like a big deal at all. 8 hours in the car is very good for getting binding done. I've got one and a half quilts done and one and a half quilts to go. It's been a while since I've been caught up on binding. No pictures yet, but as soon as they are all done I'll do a celebratory photo shoot. Woohoo soon to come. Thanks to Candace for today's idea about how to mason jars. Lots of people have jars around for canning purposes. You can buy them by the case at Walmart at a very reasonable price. Even those of us who have never canned a vegetable have some hanging around in the dusty dark recesses of the pantry. 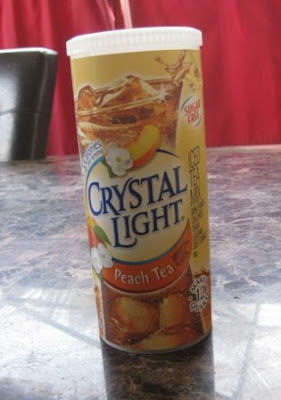 Here is a link to the idea that Candace found for using a mason jar without the lid to hold fray check and sewer's aid. It was on Erin Erikson's blog which is a new one to me, but definitely one that I will be checking out soon. That got me thinking of all of the fun ways that a simple canning jar can be used around the house. I have two that I use to hold buttons. Since I started recycling shirts into quilts, my button jar runneth over. By taking a leftover square of fabric and a bit of extra batting, between the lid and the ring, you can make a happy little pin cushion out of the top. How cute is that? 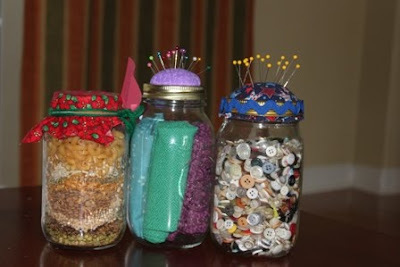 Along the same line, how about making a pin cushion on a jar and then filling it with sewing themed gifts for the favorite quilter in your life? 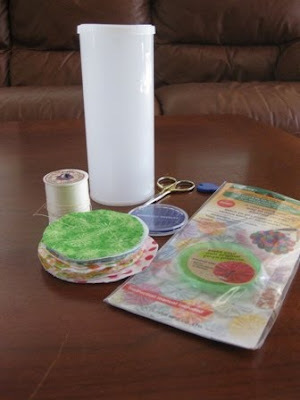 There is room for little scissors a spool of thread and a few decoratively rolled fat quarters. Every year for Christmas, I get some version of Friendship Soup from my mother-in-law. It usually contains pasta or rice along with beans and seasonings and the directions as to how to cook it. It is a nice way to give a homemade gift that doesn't have to be consumed right away. Another one that I would love to try, but haven't yet, is cake in a jar. There are two versions. You could put the ingredients for a cake (or brownies or quick breads) into a jar along with the directions as to how to bake it in a regular cake pan. The one that looked highly adorable though, was an already baked cake. Apparently you can put cake batter into a canning jar, and in the process of baking, you can get it to seal. I guess you can do it with or without frosting, but how fun would that be to get or give as a gift? So thanks again to Candace for the mason jar idea, if you will send me your snail mail, I'll send a thrifty surprise your way. Stay tuned for more ideas coming your way, each and every Thursday. My sister called this morning to make sure I had finished her curtains. 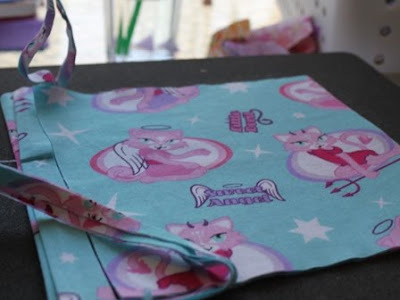 "We" made a dust ruffle for Paige at Christmas and I was sent home with matching fabrics to make the curtains. We'll be seeing her again next week and so she'd like to have her curtains. Did I finish them? Of course I did, any minute now. While I'm at it, I need to finish up the pillow shams to go with the Sister's Choice quilt that I made for Mom last Christmas. 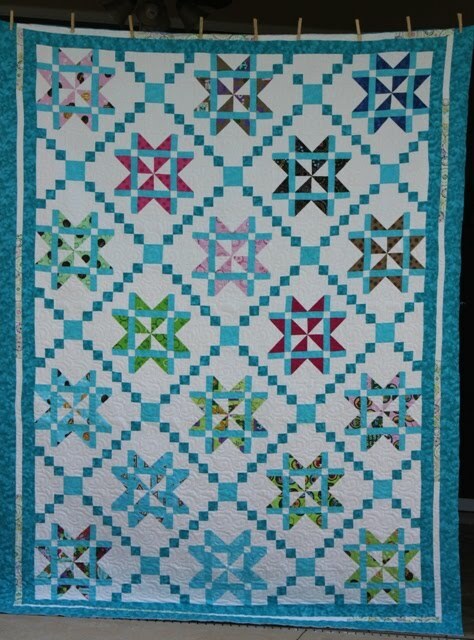 It was 109 by 109 and after sewing through my finger during the quilting, it finally convinced me that I needed a quilting machine and frame. 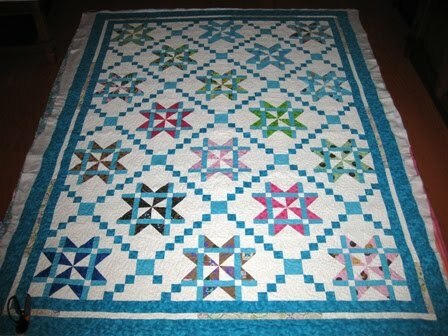 The Sister's Choice is a Bonnie Hunter pattern that uses an extremely cool technique for making nine patches. Which then combine with sew and flip triangle points. While I was at it, I decided to go ahead and whip up a few extra blocks, because my 2.5 inch strip drawer won't close, and there were some pretty jelly roll remnants that wanted to be played with. No definite plans yet, but they seem like they might turn into a Christmas quilt and a baby quilt. So, back to the pillow shams, I was going to use the same nine patch for the middle so that it ties in to the quilt, but then just use simple cornerstones and sashing strips so that they don't look exactly the same. I had the leftover fabric conveniently saved, so it shouldn't take long to get those finished up. Assuming I don't get sidetracked again that is. Happy Monday. I am feeling so good about finishing off the June Mystery Quilt to be named later that I couldn't wait to jump in to a new quilt. Anna has been reminding me lately that I owe her a quilt, so I started in on that first thing. I had to shuffle Anna off to VBS first, but I rushed home and got in these three blocks before it was time to pick her up again. Just as we were getting ready to load everyone up and head out the door, the FedEx man showed up with TWO big boxes. One was a game table for Ryan's birthday with some assembly required. But the other was my brand new accuquilt GO! No assembly required on that one. As soon as we all got back home again it was opened up and cutting scraps into bits and pieces. Now I'm running around in circles trying to figure out what to do next. I want to cut fabric with my new toy, but I need to get myself a little organized and figure out what I'm going to cut and what I'm going to do with the pieces. I have lots of ideas of course, but right now I'm lacking the discipline to focus and plan. Aren't new toys fun? Anna had an appointment for some testing this afternoon so we all went out for ice cream as treat when it was done. 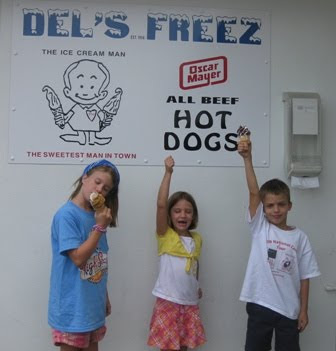 Del's freeze is one of the first places I went to when we moved to town. I signed up for a prenatal aerobics class while pregnant with Anna and we used to get ice cream when it was done. Nothing could be funnier than a gaggle of big pregnant ladies at an ice cream shop. Put's an image in your head, doesn't it? I wasn't sure it was going to be a good day when the alarm went off at 5:35. I haven't seen o dark thirty since summer started. It's hard to get a run in before the heat of the day takes over though, and I had a date for 6 miles at 6 o'clock. I got a blister at three miles and headed home, but 4.7 miles is better than no miles, and my running partner is the most understanding person I know. After that is was home to shower and do all the regular morning things. I was at Joann's right after they opened with my 50% off coupon in hand. I needed something for the back of the June mystery quilt which really needs a name already. Bought backing and binding and couldn't resist a visit to the half off clearance sale. I love clearance! Found some suede type stuff for an idea I have for the master bedroom and a piece that should work for the back of a patriotic quilt, maybe a QOV? Found another clearance section with summer plastic for the kitchen and couldn't pass up on 70% off. Did I mention how much I really love clearance? Lunch was my favorite Jason's Deli, right next to Joann's. Made it home by noon just in time for a quick nap. Had to make up for that 5:35 alarm clock, right? I took a book with me so that I could pretend to read, but nobody was buying that. Play date followed play date all afternoon while I whittled away at the three borders that this quilt called for while running the new fabric through the wash cycle. Sunday is pizza night at our house, during the summer we watch recorded episodes of Wipeout which the kids think is the best show EVER. Stories were followed by bed, and now at 8:29 I am happily cutting away at a brand new quilt. This one if for Anna. She wants wonky yellow stars and a moon on a dark blue background with the following words, "Reach for the moon, even if you miss you will land among the stars." It's a lot of words, but maybe I'll mix some wonky Tonya R. letters with some embroidery to make it all fit. 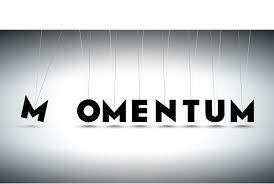 Or I could make the letters smallish and they could go all around the border? Anna has a queen sized bed, so there is room to play. There was a swim meet this morning. Kurt took Sydney and Ryan so that I could take Anna to ice skating. 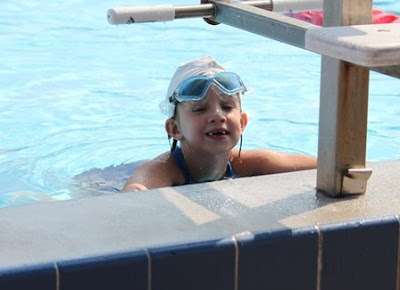 On Tuesday Sydney hated swimming, she never wanted to go to swim team again and didn't know why I was making her do it. By Thursday she wanted to go to every meet and made me promise she could sign up again next time. 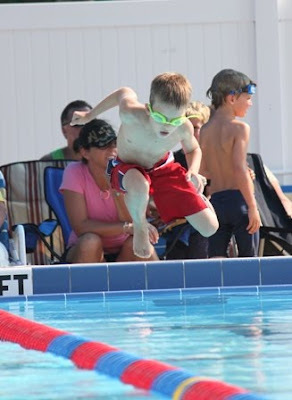 Check out Ryan's stellar form on the dive in. Did I mention that we practiced? I don't know why I find borders to be so tedious. Binding doesn't bother me, and I do fine on backings. But I've been puttering away at the borders to the June Mystery ALL DAY LONG. Now, you have to understand that all day means when I wasn't doing something with or for the kids, so the actual minutes spent are probably pretty minimal. After the swimming and skating there was some cleaning and laundry and then a series of kids in and in of the house, through the pool and back again. I took my drawer of 2.5 inch squares along played with those while I supervised. I should be all set for leaders and enders for the next few years. Our new neighbors moved in today and they have an 8 year old boy. 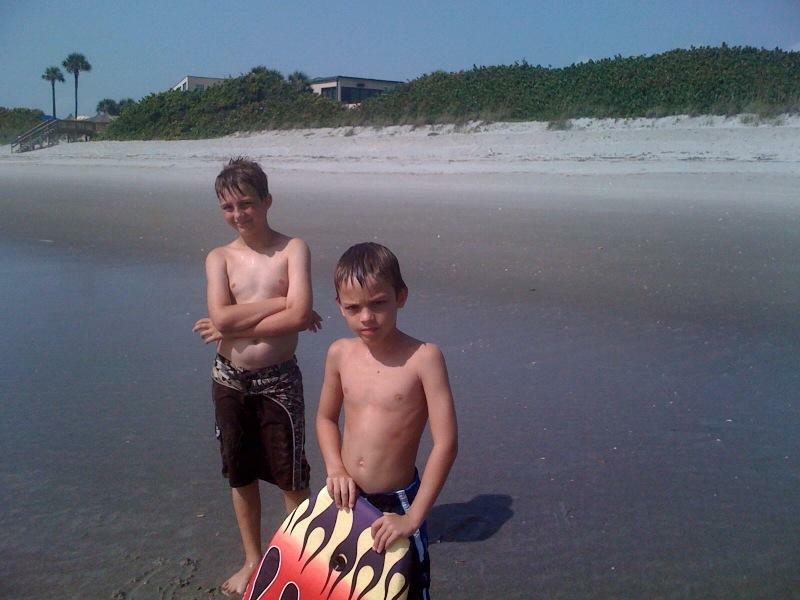 With all the friends that Sydney has around the block, it is nice to have some more boys for Ryan to play with. 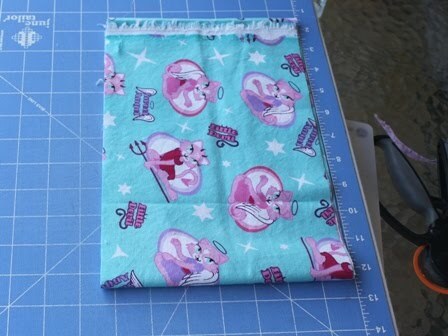 I didn't seem to have enough of the background fabric for the second border, and mixed in another fat quarter from the Girl Scout bundle with a light background. I might take all the teals from the stack and use them to make the binding. Usually I would use the extras to piece a back, but I have enough that I can make another quilt of some sort. Sydney seems to like this one, so maybe I can make the next one for Anna and they can both have their own Girl Scout quilt. I think the next one should have more green in it though, it isn't immediately obvious that this is a Girl Scout themed quilt at all.